For the past few weeks I have observed my students to get busier and more stressed. Most of them are teachers, feeling the strain of the end of the school year, and still trying to engage in their masters studies. While the last days of school before summer are bittersweet: it is wonderful to see students graduate and move on, yet we will miss them after they have gone (or, sometimes let out a sigh of relief – just trying to be realistic here, because I hear those stories, too), the path of getting to summer vacations is lined with testing. And, some more testing, and frantically documenting the learning that has occurred during the year. Meeting learning goals and objectives is important for accountability. But, I find it funny that all too often we are talking about learning goals when we actually mean teaching goals. The objective and subjective realities of teaching and learning get mixed together. Each student has a different subjective experience of the learning that happened in the class during the school year. Teacher has her/his own experience, too. So, which one is true? Our subjective realities are references to the lives we live. We see and hear things based on our preferences and expectations. Every teacher knows how hard it is to help students to learn new concepts, if they have very strong misconceptions about the topic. 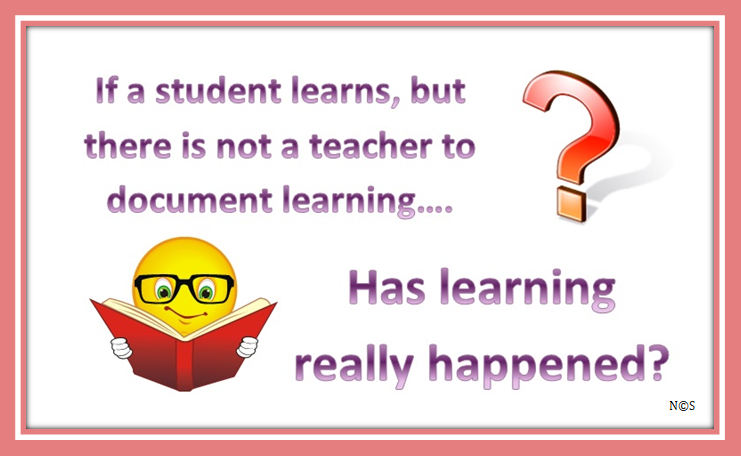 Similarly, our own observations may be clouded by preconceived ideas, and we sometimes forget how much students learn while they are not taught. Or, sometimes even in spite of the teacher (this was a common joke among the faculty in the school I taught in Finland, and I still think how a good dose of self-irony sometimes saves the day ). In education a common misconception is to believe that significant learning only happens when students are taught. In reality students are born learning machines, they learn all the time, everywhere. But teachers are needed to enhance those individual learning experiences and help students to dive deeper into the subject or the area of their interest. Documenting and testing should not be the primary focus of teaching. Yet, in today’s world we are very busy in documenting all kind of things: taking pictures and videos of events to make memories, and sharing them in social media. A common joke is to question whether a *thing* really happened, if nobody posted it into social media. This may be the modern version of the falling tree thought experiment. But how about teaching and learning? Passionate about making a change in education. Firm believer in the best teacher being the one who makes herself unnecessary by empowering students to become autonomous learners.